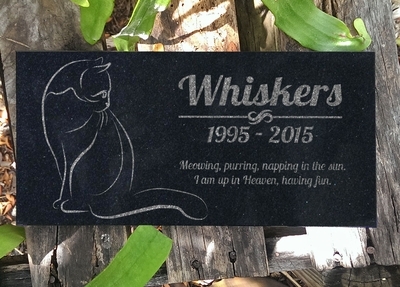 Personalized Cat Memorial / Cat Memorial Stone Black Granite In Memory of Grave Marker with Cat Design and Personalized with Name of Cat, Birth/Adopted Date - Passed Away Date, and Special Quote. SIZE & DESCRIPTION OF STONE: Dimensions: 12X6 Thickness: Little Less than half an inch Engraving: Grayish White Material: Granite Black Stone Laser Etched, so it is Personalized Forever! You can put ANY special message you would like onto the stone. Below, we are just giving you a few special messages that may speak to you, if you would like something different than our set quote. "You Left Paw Prints On Our Hearts" "What greater gift than the love of a cat/dog." "Always In Our Hearts And Never Forgotten" "Lovingly Remembered Forever Missed" "A Faithful Friend, Never Forgotten" "Deeply loved, completely spoiled, and missed beyond words." "Gone Too Soon, But Never Forgotten. We Love You" "No longer in our laps but Forever in our Hearts " "I came, I purred, I conquered...And left a trail of beautiful memories." "When tomorrow starts without me, Don't think we're far apart, For every time you think of me, I'm right here inside your heart." "Once by our side. Forever in our hearts " "You Have Left Our Lives, But You Will Never Leave Our Hearts." "No longer by our side...but always in our hearts" "You Were Our Favorite Hello And Our Hardest Goodbye"